A second man is claiming he slept with South Carolina gubernatorial candidate Nikki Haley, but her campaign blames "the good old boys" for the allegations. Who's right? Jim Davenport of the AP reports that lobbyist Larry Marchant, who until yesterday worked for the campaign of Haley rival and current South Carolina Lt. Gov. Andre Bauer, says he had a one-night stand with Haley in 2008. Like blogger Will Folks, who claimed a past relationship with Haley last week, Marchant hasn't offered direct proof, saying, "I didn't have any evidence because you can't have any evidence on a one night affair - you don't have that." And as with Folks, Haley's campaign has been quick to deny the allegations. Haley herself says of Marchant's claims, "This is just disgusting politics. Two or three months ago I was Nikki who? and nobody was saying anything and a couple weeks ago we started going double digits up in the polls and now we have had everything thrown at us." And her campaign manager Tim Pearson alleges sexism: "As Nikki Haley rises in the polls, the good old boys in Columbia see their taxpayer-funded fraternity party coming crumbling down, and they will say or do anything to hold onto their power." It's not clear if Haley, who's been endorsed by Sarah Palin and shares her small-government beliefs, is actually a victim of sexists who want to see a woman brought low, of cynical politicians who would seek any form of attack regardless of gender, of her own indiscretions, or all of the above. Marchant does seem a little shady — while Haley hinted that Folks might be paid by one of her opponents, Marchant actually was — at least until yesterday, when he resigned from Bauer's campaign due to "inappropriate conduct not in keeping with the goals of this campaign." Andre Bauer denies "shopping" Marchant's story, and Marchant says it's "crazy" to think he was paid to bring Haley down, but his stated reasons for going public don't sound terribly convincing. 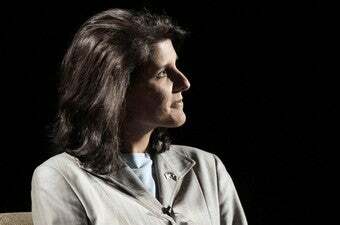 He says that after Haley claimed to have been completely faithful to her husband, "It just gnawed at me to the point I had to confide in my wife and then we both made a joint decision that I was not going to push the issue but that if I was confronted, I was not going to lie about it." But why didn't the one-night stand "gnaw at him" before Haley launched her campaign and started doing well in the polls? And was he really "confronted?" Marchant says Bauer asked him to resign when a reporter started asking about the affair, but the AP's Davenport notes that publicly acknowledging Marchant's "inappropriate conduct" was an "unusual step." It's almost like Bauer's camp wanted reporters to keep asking. During the Tuesday debate, Bauer claimed that illegal immigration was caused by lavish government welfare payments, which caused poor people to refuse to do manual labor. Haley bragged that she had opposed the federal stimulus program. The attorney general, Henry McMaster, who is currently suing to try to stop the federal government from bringing health care reform to South Carolina, attributed the failures of the state's public schools to teachers' being so busy "filling out federal forms that they can't teach." Mike Huckabee may have called Andre Bauer "tea party before there was a tea party," but really all the candidates appear engaged in a race to the bottom in terms of what their state should do for its people. And while it's possible that Haley, as a woman of color, has become the target of the "good old boys," ideologically she's right there with them.